2016 is the tenth anniversary of the Reno rabbit rescue where 1250 rabbits were rescued by Best Friends Animal Society. I would like to honor these brave rabbits by posting stories by those that worked with them, adopted and in so many ways cared for and loved these rabbits. Please enjoy Dennell’s story. She has since passed away but her husband Ryan continue to care for the remaining rabbits. 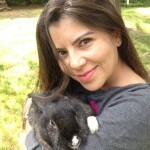 It started with a rescuer who took in homeless bunnies, neutered them, and gave them nice lives. She did this for 28 years. But then her health began to fail, and nobody seemed to read the figurative sign on the door that said, “Don’t drop any more bunnies off at this address!” Instead, folks kept dumping them over the fence. The rescuer didn’t know how to return the little care packages to the people who had dumped them. She was too ill to take care of them, or to stay on top of the neutering, or know when another rabbit had been dumped in her yard. As the uninvited guests began to multiply, she went in search of help. When the Best Friends team received the call about the rabbits, they couldn’t quite believe what they were hearing. What did you say? You have 80 rabbits? “No,” said the caller, “I have 800 and they are multiplying!” It was time for drastic measures and time to put together the most ambitious bunny rescue ever. The Best Friends team began their endeavors by putting together a new rescue center which included leasing additional property to house the rabbits, bringing in medical support to help spay/neuter and care for the ill, and reaching out to animal rescue groups throughout the country to help with housing these beautiful creatures, which by now was up to 1200 rabbits. One of these rescue groups was here in New Mexico. 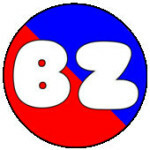 In 2008, I started volunteering for this local animal rescue group to help make a difference in the lives of animals. While the animal rescue group rescued many precious animals, my heart was drawn to the rabbits who I felt needed special attention. After talking to one of the employees at the rescue group, I discovered that some of their rabbits were from The Great Bunny Rescue and every time I saw the beautiful rabbits, I wondered which ones were from Reno, NV. A couple of years later the office manager handed me about 22 colored folders. To my surprise, each folder contained the picture, microchip number, gender and brief medical description of the rescued Reno rabbits. Through the microchip number, I was able to identify the few remaining Reno rabbits from the rest of the rabbits. Over the years, some of them began to develop ailments and in 2013 NMHRS offered to take them all from the local animal rescue group and give them a safe and healthy forever home. When NMHRS agreed to take in these rabbits, it was not without lengthy discussion and serious concern about the resources and finances involved. By the beginning of 2014, it was apparent that NMHRS was in danger of running out of funds and our pledge to care for these rabbits for the rest of their lives was in jeopardy. Our wonderful volunteers stepped forward to ramp up our fundraising. People like Matt Wasson, Palin Wiltshire and Iris Klimczuk-Massion organized bake sales, raffles, and estate sales, while Deb Velasquez made another wonderful quilt and people like Liz and Kevin Hogan ensured maximum ticket sales. All of this effort along with the garage sale held at my house helped to ensure that we can continue to provide the level of care necessary to these now elder buns. The volunteer dedication to clean the Rabbitat is equally impressive. Ned Nevera, Kerrie Bushway97, and Liz Sharp give up weekends to help with cleaning, Regina Schacht helps with purchasing straw, hay and pellets monthly, and Beth Wagner picks up the dirty straw every week to dispose of it. Other volunteers like Victoria Perez, and Deb and Bill Velasquez have stopped by to help with nail trims and health checks. We have a great group of volunt eers who have all had a hand in some way supporting these bunnies so that they can live out the rest of their lives in comfort and dignity. We are very proud of each and every one of them. When I think about the history of our sanctuary rabbits, I think about the Reno rabbits and their journey from Reno, NV to 7104 Osuna Rd NE Albuquerque, NM. I think about the time I read about the Great Bunny Rescue and how it touched my heart so much that I kept the article. Little did I know that I would someday be a part of that story and the rabbits would touch my heart in such a special way. Editor’s Note: It is important to recognize the time and commitment that Dennell and her husband, Ryan, have put in to this effort. They gave up part of their home and hearts to make sure that these bunnies were saved. They are burdened with the daily care including vet visits and making sure that everybun is cared for every day. They also take on a significant part of the financial burden. They do this, not for recognition, but because of the love in their hearts for those that have been discarded by society. We owe them our deepest gratitude for all they are doing. Please listen to my podcast on Bunnyzine. We talked about the dontdumprabbits.org website, community rabbits and what we can all do to help the rabbits. It is… an hour long, so you might want to listen to half at a time or relax with your feet up for an hour! Share! Help Las Vegas HRS to Fund “No Dump” Billboards! Las Vegas is the site of, unfortunately, one of the largest dumped rabbit colonies in the United States, with perhaps as many as 1000 rabbits living there. Las Vegas HRS is raising money to fund a billboard which would educate the community of Las Vegas about the problems with dumping domestic rabbits. HRS is offering a $1000 matching grant to help get this billboard funded. 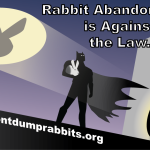 After the first billboard is placed in Las Vegas, it is our hope that these billboards can be placed around the country, in any area where there is a similar problem with abandoned rabbits. To donate, please visit here.